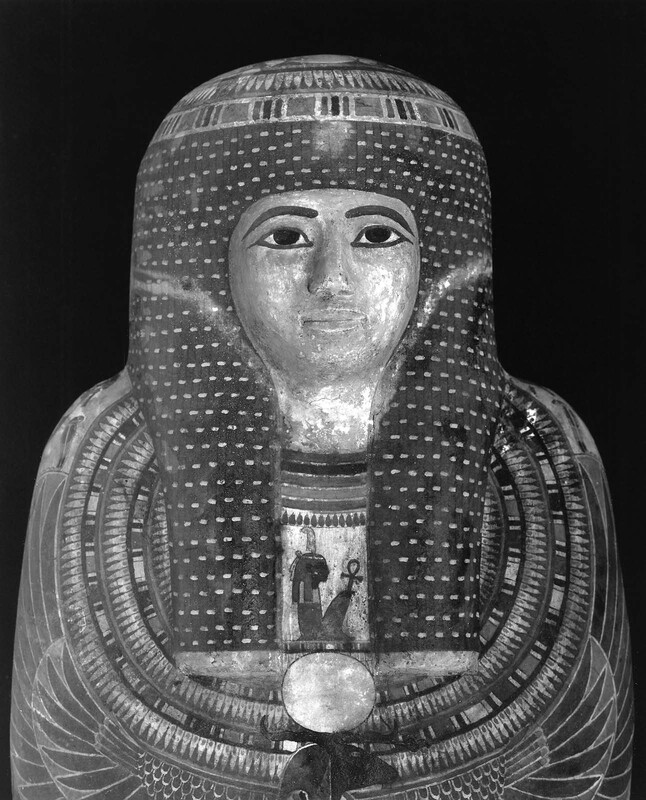 An innovation in funerary equipment in Dynasty 22 was the one-piece mummy case made of cartonnage. A core of mud and straw in the shape of a mummy was first covered with plaster. Layers of linen were then adhered to the plastered core with plant gum, leaving a hole at the foot end and a long narrow slit in the back. The surface was then coated with gesso, the core was removed through the slit in the back, and the wrapped mummy inserted in its place. The back was then sewn up, the foot end was plugged with a wooden board, and the sealed mummy case was delivered to painters to be decorated. This cartonnage mummy case of Lady Tabes is one of the earliest of this type and one of the finest. Protective winged deities figure prominently in the decoration. No fewer than six pairs of wings wrap around Tabes’s mummy. Two falcons - the first one ram-headed with up-curved wings, the second one bird-headed with wings spread out horizontally - stretch across her upper body. Below them, on the sides, are a pair of winged goddesses and a pair of falcons, their wings crisscrossing down the center of her lower body in a swirl of plumage. They are labeled Isis, Nephthys, Neith, and Selqet, the four traditional protective funerary goddesses.